The Cathay Pacific 11km and Half marathon is a long standing running and walking event that has been a feature of the Auckland waterfront since the 1980's. I remember running the half marathon when it started from the (former) Hyatt Hotel and finished at the downtown end of Queen Street. Over the years is has changed sponsors, with Cathay Pacific Airlines, Barfoot and Thompson Real Estate and Asics being major supporters. The event is organised and superbly managed by the Calliope Athletics and Harrier Club, who have refined and changed the route to allow both distances to be run simultaneously without undue disruption to each other. Generally held on the last Sunday of February, the timing provides a great New Year's resolution kick start to your training. The unique features of this event are the staggered start, allowing competitors who walk or jog to commence earlier than faster entrants. There is minimal disturbance and jostling as the event gets underway, but ensures that most competitors finish within a reasonable time frame of each other. It often takes a monumental effort for a less fit or slower individual to complete an endurance event and this collective finish is so much more rewarding and inclusive. There is nothing more demoralising to see the water stations and finish shutes being pulled down, as is the case for many events, when you are a slower competitor. Therefore the Cathay Pacific is an ideal introductory or nursery event for newcomers to distance events. The feeling of being in a large team is also evident as every competitor tends to wear the event singlet. The colour of this singlet changes every year. 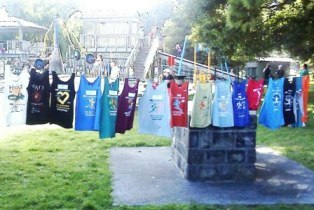 They are a popular training shirt, and you often see the "colours" worn throughout the year. In 2005, the Cathay Pacific was the first to welcome Nordic Walkers. I remember when walkers started entering "running" events and how runners objected! Nowadays, walkers can make up the greater majority of participants at any event, so it has been understandable that concerns would be raised that "stick-walkers" would be prejudiced against. The format of the Cathay Pacific is ideal for Nordic Walkers, as many of the entrants leave earlier than their specified start time. It is a "clean" event, without undue congestion, and Nordic Walkers employ safety strategies. After 8 races, without incident, Nordic Walking has developed a loyal bond to the Cathay Pacific. 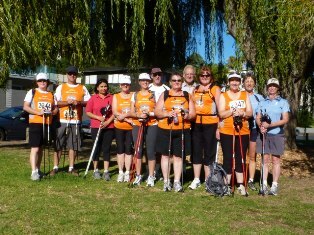 In 2010, when the event was cancelled due to a tsunami alert, the Nordic Walking team completed the walk the very next Sunday, all proudly wearing the bright orange Cathay Pacific singlets! As a result of the confidence given by the race organisers to include Nordic Walking, I am now often contacted by race organisers of other events, inviting Nordic Walkers to participate. Every year, staring in mid January, a Nordic Walking Training Squad commences training towards the goal of completing the Cathay Pacific. 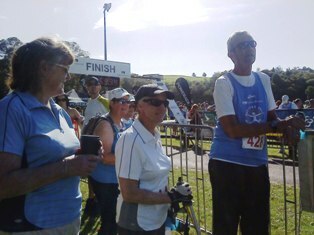 This training has formed the foundation for many Nordic Walkers to continue on to complete other endurance events, including marathons and long distant traverses (NZ and worldwide).